Air Blue Leather Dye Kit with Preparer by TRG "the One"
Includes dye, preparer, brush, applicator sponge and multi lingual instruction sheet. For all leather products, imitation leather and canvas products, but not suede! 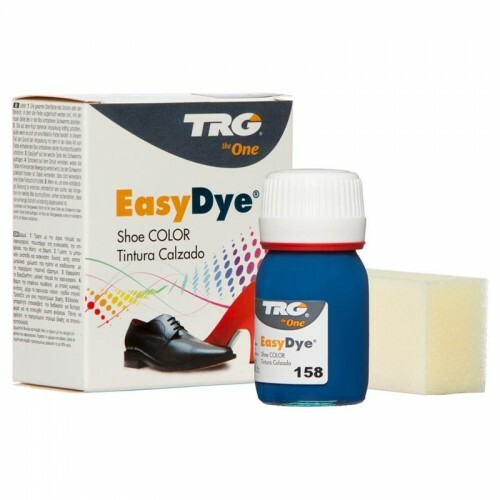 For leather, apply the TRG Preparer (supplied in kit) and use with a (new) standard kitchen green scouring pad in order to remove dirt, shoe creams and protectors on the leather which would prevent the correct application of the dye. For synthetic leather, rub with a soft cloth soaked with TRG Preparer (supplied in kit) and dye immediately after this. (Do not use a green scourer like you do for real leather items). For canvas, wash with water and soap, apply one or two coats of dye on the damp canvas by following the below procedure. Stir the bottom of the bottle of dye (supplied in kit) with the brush (supplied in kit) until you have thoroughly mixed the dye. With the half-wrung brush paint the joints between the sole and the leather, on sewing and scratches, ornaments, etc.. Apply one or two brushstrokes of dye on one end of the sponge (supplied in kit). Rub gently in a circular motion on all the surface to be dyed. Applying another brushstroke if necessary. Without adding more dye some touches can be applied with the sponge on the dyed surface in order to even up the colour. Once the first coat is dry apply a second coat by repeating the operation in order to even up all the colour. Apply a third coat if needed. Once the procedure is finished, wash the sponge and the paintbrush with water in order to prevent them from drying out. It will be observed that having applied 2 or 3 coats, the quantity of dye used is very small and therefore a result of dyeing and not being painted. The leather gets smooth and flexible and the dye will never peel off. After 5 hours the dye will be completely dry and resistant to a dry or wet rub.